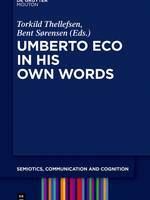 This volume contributes to the advancement of the understanding of Umberto Eco's (1932-2016) excellent work in semiotics, communication and cognition. The forty scholars who participate in the volume come from a variety of disciplines but have all chosen to work with a favorite quotation from Eco that they find particularly illustrative of the issues that his work raises. My essay starts from this Eco's quotation:"Since the reader is supposed to single out the elementary ideological structures of the text, this operation is overdetermined by his ideological subcodes. This means that not only the outline of textual ideological structures is governed by the ideological bias of the reader but also that a given ideological background can help one to discover or to ignore textual ideological structures" (Umberto Eco, The Role of the Reader, 1979, p. 22). cfr. Cinzia Bianchi, “Textual Ideological Structures and Reader Competence in the Interpretative Semiotics of Umberto Eco” in Torkild Thellefsen, Bent Sørensen (eds.) 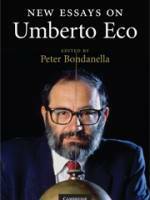 Umberto Eco in His Own Words, vol. 19 of the series edited by Paul Cobley and Kalevi Kull "Semiotics, Communication and Cognition”, Boston/ Berlin, DeGruyter-Mouton, 2017, pp. 127-133. Blu’s destruction of his work in May 2016, as an extreme response to the exibition Street Art - Banksy & Co.: Art in the Urban Form, placed Bologna at the center of international attention, and again forced the academic world to reflect on street art. The subject has in fact become a topic of collective interest, involving directly private citizens, institutions and movements in Italy, and it forms the framework for the issue 18 of Ocula. We ask experts in the fields of semiotics, philosophy, sociology and art history to use this single case to reflect on the themes of musealization, transmission and preservation of street art. The authors have investigated the many contradictions of this phenomenon--illegality and institutional recognition, anonymity and authorship, ephemerality and conservation--, and in so doing they tried to respond to our questions: Who does street art belong to? How is it expected to evolve? 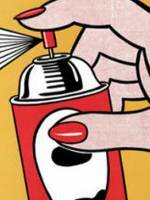 Can street art and graffiti writing be preserved? And how? What is the relationship between street art and new media? cfr. Cinzia Bianchi, Silvia Viti (eds.) 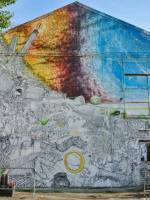 Street art: iconoclastia e istituzionalizzazione | Street Art: Iconoclasm and Istitutionalization in Ocula, vol. 18, n° 18, pp. 160, september 2017.
cfr. Cinzia Bianchi, Silvia Viti Introduction. Street art: Iconoclasm and Istitutionalization in Ocula, vol. 18, n° 18, pp. 1-6, september 2017. 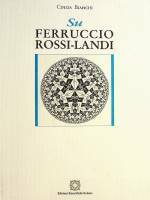 The work of Ferruccio Rossi-Landi, which began in the fifties and ended in the mid-eighties, ranged through philosophy and linguistics to semiotics. 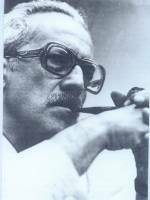 My essay aims to provide a systematic presentation of the contribution of Rossi-Landi’s work, taking into account the various theoretical stages that led him to conceive and study language from such an original point of view. Through his "homological schema", material and linguistic production are conceived to be the result of a single process that is particular to human beings and that can best be understood in terms of work and trade. The essay focuses particularly on the critical debate that surrounded Rossi-Landian theory, presenting some of the objections of the scholar’s contemporaries together with his reactions to them, as well as touching on more recent interpretations. This book is an anthology of selected papers on Umberto Eco’s theory of semiotics. The essays in this collection seek to bring to a broader and variegated readership a discussion of Eco’s work as it pertains to broad spheres of human activity. In particular, these essays focus on the act of interpretation, on the formation of culture as a matrix of thought, of the perceptible and imperceptible acts of translation, and on the regulative theoretical hypothesis of the encyclopaedia. These essays address highly cogent issues in semiotic and cultural studies and reflect the debate began in Bologna in the 1990s between Eco and some of his researchers and students, but which has not had sufficient impact abroad because of limited circulation outside national boundaries and the Italian language. Authors: Cinzia Bianchi, Marcel Danesi, Nicola Dusi, Isabella Pezzini, Valentina Pisanty, Piero Polidoro, Giampaolo Proni, Clare Vassallo, Patrizia Violi. cfr. C. Bianchi, C. Vassallo (eds.) Semiotica. Special Issue: "Umberto Eco’s interpretative semiotics: interpretation, encyclopedia, translation" volume 206, issue 1/4, 2015.
cfr. 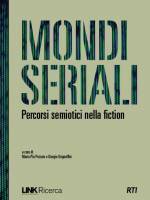 C. Bianchi, C. Vassallo Introduction: Umberto Eco’s interpretative semiotics: Interpretation, encyclopedia, translation pp. 5-11.
cfr. C. Bianchi Thresholds, boundaries, limits: Ideological analysis in the semiotics of Umberto Eco, pp. 109-127. In questo saggio viene presentato un caso studio riguardante la marca Borsalino, la cui evoluzione comunicativa si intreccia strettamente con la storia aziendale. Rimangono presupposti imprescindibili di questo breve lavoro sia la storia della pubblicità e soprattutto della cartellonistica della prima metà del Novecento, sia la metodologia semiotica che ci ha permesso da una parte di scegliere un corpus coerente ma limitato di immagini da confrontare e dall’altra di individuare elementi testuali costanti e variabili, adottando un punto di vista prevalentemente diacronico. cfr. "Parabole aziendali e innovazione comunicativa. 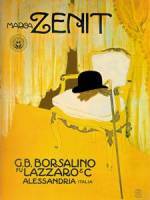 La storia del cappellificio Borsalino”, in Ocula Flux-Saggi, 2014. Quali strumenti teorici sono utili per comprendere l’organizzazione di una campagna pubblicitaria? In che modo descriverne l’evoluzione storica? Come comparare pubblicità di un medesimo periodo riguardanti uno stesso prodotto di consumo, come per esempio le energie rinnovabili? Il libro risponde a queste e altre domande, da una parte concentrandosi su una forma testuale specifica, l’annuncio pubblicitario; dall’altra utilizzando gli strumenti semiotici, in particolar modo quelli provenienti dall’analisi del visivo. L'obiettivo è quello di avvicinare l’indagine testuale di ispirazione semiotica, considerata spesso troppo complicata, a una vasta platea di lettori, dagli studenti dei corsi di comunicazione ai professionisti del settore. cfr. 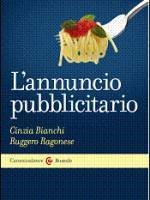 C. Bianchi, R. Ragonese L'annuncio pubblicitario, Milano, Carocci Editore, 2013. This paper provides an overview of semiotic studies about advertising, beginning with the early work done in the 1960s. Advertising communication plays a particular role in semiotic studies in the second half of the twentieth century. Pioneering studies of advertising messages, in particular those of Roland Barthes and Umberto Eco, date to the 1960s and were carried out for the most part using the tools of classical rhetoric. Following a period in which semiotics displayed a relative lack of interest in advertisements, in the 1980s advertising texts were used as examples in applied narratological analysis by Jean-Marie Floch and others. This occurred at the same time as the so-called “passion turn of semiotics,” which stressed that the passions and emotions present in texts are crucial issues in textual semiotics, and it also seemed to offer fresh perspectives for the analysis of advertising communication. The passion turn took account of the evolution of advertising itself, since modern advertising is more and more interested in conveying passions and emotions. The effectiveness of an advert tends to be closely bound up with the presentation of sensations associated with a given product or brand. Recently, semioticians have begun to study more general features of advertising and marketing discourse. cfr. 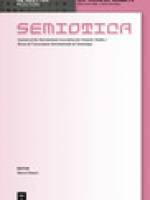 ,“Semiotic Approaches to Advertising Texts and Strategies: Narrative, Passion, Marketing” in Semiotica. 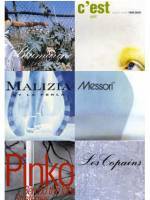 Journal of the International Association for Semiotic Studies (De Gruyter Mouton), vol. 183, February 2011, pp. 243-271 (Semiotica. Special Issue: "Semiotics and Postmodernity"). La semiotica e il progetto 2. Spazi, oggetti, interfacce si presenta come una ulteriore tappa di riflessione su un tema molto caro ai componenti del gruppo di ricerca che lavora alla rivista Ocula. Occhio semiotico sui media. Infatti, come nel precedente volume: La semiotica e il progetto. Design, comunicazione, marketing, viene approfondito il tema del rapporto tra la disciplina semiotica e la progettazione, prendendo questa volta le mosse da una domanda specifica:“Come può la semiotica essere utile alla progettazione?”. Con quali mezzi e metodi, in quali ambiti, in quali momenti del percorso progettuale, con quali relazioni con altre discipline e metodologie? La semiotica viene così sollecitata a una sfida: si tratta infatti di comprendere fino a che punto essa possa intraprendere vie di sperimentazione, oltre che di indagine teorica. Questa seconda raccolta dei saggi è così anche testimonianza di casi di pratica effettiva con progettisti o per progettisti, di applicazioni ed esperienze. È il racconto di come semiotici e progettisti si possono incontrare sul campo. cfr. M. Deni, G. Proni (a cura di), La Semiotica e il progetto. Design, comunicazione, marketing, Milano, FrancoAngeli, 2008.
cfr. C. Bianchi, F. Montanari, S. Zingale (a cura di), La Semiotica e il progetto 2. Spazi, oggetti, interfacce, Milano, FrancoAngeli, 2010. Il mio contributo specifico al secondo volume si intitola: "Semiotica e progetto: questioni di pertinenza" e affronta la questione dal punto di vista di una teoria della pertinenza semiotica, spaziando tra riflessioni filosofiche sul concetto generale di pertinenza ed esempi di pratiche di analisi concrete. cfr. 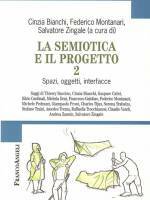 C. Bianchi, "Semiotica e progetto: questioni di pertinenza" in C. Bianchi, F. Montanari, S. Zingale (a cura di), La Semiotica e il progetto 2. Spazi, oggetti, interfacce, Milano, FrancoAngeli, 2010, pp. 285-301. Si tratta di un saggio sulla teoria semiotica di Umberto Eco in cui si presentano alcuni dei principali temi affrontati dallo studioso nei suoi libri più teorici. Nel saggio viene sottolineata l'eredita del filosofo americano Charles S. Peirce, la riflessione sui modelli di conoscenza enciclopedica, la teoria dell'interpretazione, il ruolo del lettore nella comprensione dei testi fino ai suoi più recenti interessi nei confronti degli studi sulla traduzione. cfr. C. Bianchi, M. Gieri, "Eco's semiotic theory" in P. Bondanella, ed., New essays on Umberto Eco, Cambridge University Press, 2009, pp. 17-33. Cura e Introduzione del numero monografico di Ocula n° 11 dedicato alla televisione, ad alcuni suoi programmi e serial con particolare attenzione alle loro più recenti evoluzioni. Il numero della rivista raccoglie saggi su singoli programmi come Affari tuoi o Deejay chiama Italia, su alcuni generi televisivi come l'informazione, la sitcom e i nuovi polizieschi, ma si sofferma anche su alcuni fenomeni culturali che trovano nel mezzo televisivo una cassa di risonanza privilegiata. Si tratta di un saggio che discute alcuni aspetti della produzione televisiva italiana che negli ultimi anni ha presentato un consistente numero di sceneggiati, documentari e programmi di approfondimento riguardanti fatti storici del passato più o meno recente. L'argomento della "televisione della memoria" viene approfondito attraverso il confronto testuale tra due fiction e una cosiddetta docu-fiction che ricostruiscono un avvenimento della nostra storia recente, cioè la cattura del boss mafioso Bernardo Provenzano (11 aprile 2006). cfr. “Raccontare la storia: fiction e docu-fiction tra ciotole di latte, antenne e buste della spesa” in M. P. Pozzato, G. Grignaffini (a cura di) Mondi seriali. Percorsi semiotici nella fiction, Milano, LINKRicerca, 2008, pp. 227-243.
cfr. “La domenica nel pallone” in U. Volli (a cura di), Culti TV – Il tubo catodico e i suoi adepti, Sperling & Kupfer Editori – RTI, 2002, pp. 298-343.
cfr. “Forme di testualità televisiva: indicazioni metodologiche e pertinenza socio-semiotica” in P. Bertetti – G. Manetti (a cura di) Forme della testualità, Torino, Testo & Immagine, 2001, pp. 259-267. Come accade sempre dopo ogni campagna elettorale, anche quella che si è consumata nei primi mesi del 2006 ci ha fornito interessanti eventi comunicativi, situazioni ed esempi che possono essere approfonditi da diversi approcci disciplinari. In questo articolo ho cercato di mostrare come la semiotica possa lavorare su alcuni esempi specifici di una campagna elettorale, esplicitandone al contempo i suoi strumenti che, tra l’altro, si stanno evolvendo velocemente e in concomitanza con la riflessione più generale sui suoi oggetti d’analisi, le sue metodologie e il suo statuto epistemologico. 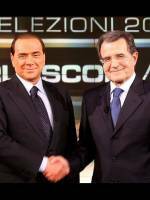 Gli esempi presi in esame sono essenzialmente tre: l’intervista di Berlusconi rilasciata a Lucia Annunziata durante la trasmissione “In mezz’ora” (Raitre, 12 marzo 2006); i faccia a faccia tra Berlusconi e Prodi prima delle elezioni (14 marzo e 3 aprile 2006); gli speciali elezioni del pomeriggio-sera del lunedì 10 aprile. cfr. “Il discorso politico durante la campagna elettorale del 2006: esempi testuali al vaglio dell’analisi semiotica” in ComPol- Comunicazione Politica, vol. VIII, n°1, 2007, pp. 31-47.
cfr. “Forme e modalità della comunicazione politica: l’esempio dell’Appello agli elettori” in M. Livolsi – U. Volli (a cura di), Personalizzazione e distacco. Le elezioni europee e regionali (1999-2000), Milano, FrancoAngeli, 2000, pp. 75-87. Il rapporto tra semiotica e pubblicità si è ormai consolidato, a partire dai primi studi degli anni sessanta di Roland Barthes e Umberto Eco fino alle successive applicazioni della semiotica narrativa ai testi pubblicitari. Esiste però una forma testuale che sembra meno ricca di riflessioni semiotiche: lo spot pubblicitario. Il libro intende colmare tale lacuna teorica e bibliografica, proponendo un’analisi attenta a tutte le dimensioni implicate nella “forma spot”: le dimensioni narrativa, enunciativa e passionale. Ma uno spot pubblicitario è anche una comunicazione finalizzata e per questo un tale progetto non può fare a meno di affrontare concetti semiotici che hanno avuto un grande “successo” nel marketing come, per esempio, l’utilizzo del quadrato dei consumi di Jean-Marie Floch o la teoria dei mondi possibili applicata alla marca. L’obiettivo è quindi quello di richiamare l’attenzione di docenti, studenti e professionisti su un insieme di strumenti applicativi, restituendo uno spessore “teorico” a ciò che la pratica pubblicitaria ha reso talvolta asettico e decontestualizzato. cfr. 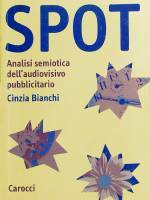 Spot: analisi semiotica dell’audiovisivo pubblicitario, Milano, Carocci Editore, 2005. Lo spot pubblicitario è anche l'argomento principe del numero monografico "Sguardi semiotici sulla pubblicità", curato insieme a Andrea Zannin per la rivista telematica Ocula.Occhio semiotico sui media. Cercare i meccanismi e i dispositivi di potere nelle ideologie, nei dibattiti sulla formazione delle identità culturali e nelle pratiche di traduzione contemporanee vuol dire seguire le tracce di una presenza spettrale, nascosta nelle maglie dei discorsi, dei testi e delle rappresentazioni. Spettri del potere tenta di recuperare queste tracce, presentando al pubblico italiano alcuni saggi degli autori più significativi degli studi culturali. Slavoj Zizek, Gayatri C. Spivak, Stuart Hall, Homi K. Bhabha, Lawrence Venuti e Barbara Godard affrontano tre questioni al centro della riflessione teorica degli studi culturali: la natura dell'ideologia e delle posizioni ideologiche sottese a ogni atto interpretativo; il dibattito sulla costituzione discorsiva e psicologica dell'identità e delle sue forme postcoloniali; il ruolo della traduzione come pratica di riscrittura e di formazione delle identità culturali come, per esempio, dell'identità femminile e femminista. E' quest'ultima una traccia ulteriore che attraversa le tre sezioni di cui è composto il volume, che comprende anche un ampio saggio introduttivo delle curatrici e specifiche premesse dedicate all'ideologia, all'identità e alla traduzione. cfr. (in coll. 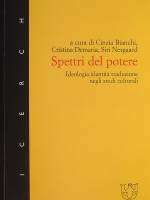 con C. Demaria, S. Nergaard) Cura e "Introduzione: le strategie della cultura" del volume Spettri del potere: ideologia, identità e traduzione negli studi culturali, (Roma, Meltemi, 2002); cura della prima parte intitolata “Ideologia” e introduzione: “Le rimozioni dell’ideologia” (pp. 31-39); traduzione del saggio di S. Zizek, “The Spectre of Ideology” e (in coll. con S. Nergaard) del saggio di L. Venuti, “The Formation of Cultural Identities”. Questo lavoro riprende molte tematiche che ho affrontato nella mia tesi di dottorato intitolata: Sull’ideologia: una riflessione tra storia, riletture e modelli semiotici (discussa presso l'Università di Bologna, 3 giugno 1997, coordinatore prof. Umberto Eco). Si tratta della relazione finale di una ricerca commissionata nell’autunno 1999 dal Corso di Perfezionamento della Moda dell’Università di Bologna e dal CITER di Carpi e che si è conclusa nella primavera del 2000. Ha collaborato alla ricerca Cristina Demaria e in particolare all’analisi di alcune immagini dei cataloghi di moda. L’obiettivo della ricerca è stato duplice: da una parte si è proceduto all’analisi semiotica delle campagne promozionali, dei cataloghi e dei testi pubblicitari attraverso cui alcune aziende tessili dell’Emilia-Romagna fanno conoscere i loro prodotti; dall’altra, si è voluto individuare le strategie comunicative messe in atto dalle aziende, valutando il rapporto comunicativo che le stesse aziende instaurano con il mondo del commercio a partire sempre dal materiale informativo prodotto. Per consultare il testo completo vedi La comunicazione nel sistema moda. Analisi semiotica delle strategie comunicative delle aziende tessili dell’Emilia-Romagna”, in Ocula. Occhio semiotico sui media, 2004. Il libro è dedicato a Ferruccio Rossi-Landi, la cui produzione scientifica spazia dalla semiotica alla filosofia del linguaggio, in un arco temporale che va dagli anni cinquanta alla metà degli anni ottanta. Con il suo lavoro di ricerca, divulgazione e traduzione ha favorito il cambiamento della cultura italiana di metà novecento, contribuendo alla costituzione della disciplina semiotica. L’impegno di promotore culturale si è coniugato con una spiccata originalità intellettuale; con grande ricchezza di idee e proposte teoriche ha compiuto ricerche che hanno carattere interdisciplinare e riguardano vari campi di studio solitamente noti come filosofia, semiotica, economia, antropologia. Il libro rielabora il contenuto della mia tesi di laurea dedica a Rossi-Landi (discussa presso l'Università di Bologna il 15 novembre 1990, relatore prof. Umberto Eco). cfr. “Rossi-Landi e la filosofia inglese del linguaggio” in J. Bernard, M. A. Bonfantini, J. Kelemen, A. Ponzio (a cura di), Reading su Ferruccio Rossi-Landi: semiotica come pratica sociale; ESI 1994, pp. 95-111; Atti del convegno “Il testo e il segno” (Roma, 20-22 febbraio 1992). cfr. “Rossi-Landi e la semiotica del sociale: un confronto con le più recenti teorie socio-semiotiche”, in S. Petrilli (a cura di), “Lavoro immateriale”, numero XIV n. s., 7, 2003-2004 della rivista Athanor. Semiotica, filosofia, arte, Letteratura, Meltemi Editore, pp. 133-143. Atti del convegno internazionale intitolato: “The Relevance of Rossi-Landi’s Semiotics Today” (Bari, 14-16 novembre 2002). Quest'ultimo saggio, che confronta la teoria di Rossi-Landi con i recenti sviluppi della socio-semiotica, è qui disponibile in formato .pdf.